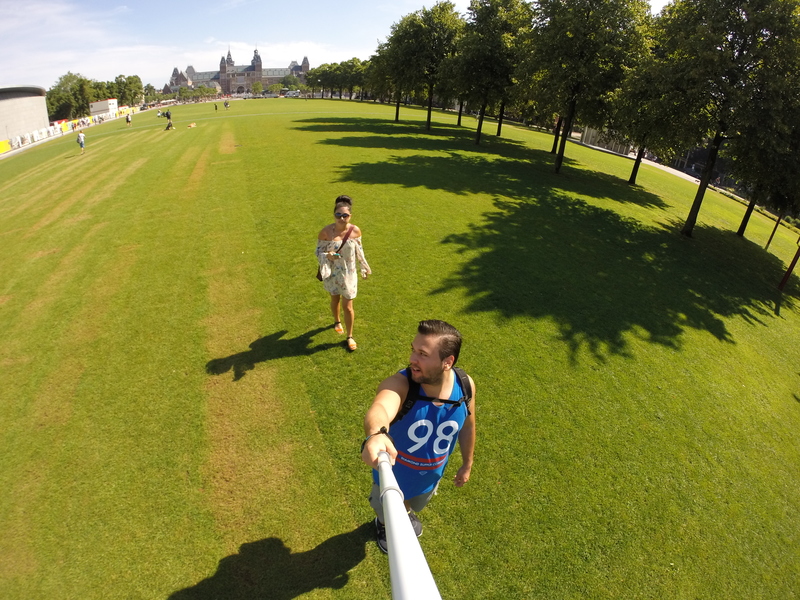 On July 19, 2014, my boyfriend and I set out on a month-long adventure across Europe. Our first stop was Amsterdam. I want to share our experiences in order to help you plan your trip to this unique city. We stayed at the Flying Pig Downtown. The Flying Pig Downtown is one of the most sought after hostels in Amsterdam, so it is important to book early! We booked our five night stay at the end of February and the rates of the room varied according to the day. The weekend rates were €69.80 for two guests in a 16 Bed QS Dorm and the weekday rates were €59.80 for the same. HostelWorld rates the Flying Pig Downtown extraordinarily high for: Value for Money, Security, Location, Staff, Atmosphere, Cleanliness, and Facilities. The Flying Pig Downtown is located just a short 5 minute walk or 1/4 mile (400m) from Amsterdam Centraal. I would highly recommend booking here. The Anne Frank House is one of the most popular attractions in Amsterdam. The Anne Frank House is a must visit attraction in Amsterdam. This historical monument can be visited most days and hours depending on the season and with some holiday exceptions. It is important to book this in advanced, unless you want to wait in a large line for a few hours. We booked our reservation on a Friday, when we purchased our I Amsterdam City Card, and booked the first available appointment which was on the following Tuesday morning. You can purchase tickets and book your appointment in the same building you buy the I Amsterdam City Card and guarantee your admission with an appointment. We even arrived early and they let us right in anyways. With the I Amsterdam City Card, you will receive a free canal cruise from a choice of a few different companies, so you have to find the cruise that is right for you and make sure you leave yourself enough time to wait in line, because there will be a line. We chose Holland International and it was great! Many of the cruises come frequently though and hold quite a few people, so don’t fret if you see a long line, it is worth the wait! We choose a glass-covered boat with windows that opened, which worked out nicely in the rain. The Red Light District is one of the most high traffic areas of Amsterdam. Honestly, I had no idea what to expect, but it was much more “family friendly” than I had anticipated, with the knowledge that this is still the Red Light District. Most of the larger streets didn’t have any ladies in the windows, but they were abundant in the smaller alleys. It is very similar t o the rest of Amsterdam, with many thriving restaurants and cobble stone walkways along the canals. Vondel Park is Amsterdam’s 120-acre park. It is absolutely beautiful and a must see. There are bike paths, benches, BBQs and ponds all over and it is a wonderful place to relax. I would highly recommend finding a nice bench or shady tree trunk, and just take in the scenery and relax. When we went, the park was covered in handmade art structures that added to the beauty of the park. Being a college student, we budgeted our trip carefully. We kept track of all our spending on my iPad in order to ensure we weren’t overspending. We budgeted €50.00 per day in spending, not including our previously purchased accommodations. By the end of our fifth day, we were about €25.00 under budget for our Amsterdam destination. We kept under budget by investing in the I Amsterdam City Card and watching what we ate. We took advantage of the local Subway and McDonald’s on occasion for meals and only dined expensively one night. We still got souvenirs and enjoyed ourselves, but keeping track of our spending as the days passed was an important part of our vacation. Transportation was made so much easier by the I Amsterdam City Card. Not only was the transportation free, but a simple bus route map was included and it was the easiest read. You simply looked up which attraction you wanted to visit and it told you what bus line to take. I do have to say that the worst part of our trip to Amsterdam was navigating from the Schiphol Airport to Amsterdam Centraal. We arrived just before midnight and we had the hardest time. We had just traveled for 18 hours and with our large backpacks on, we just wanted to get to our hostel. Many trains pass through Amsterdam Central, so they had the final destination posted and we had no clue which train would take us through there. There weren’t any maps or workers in the underground train station and most signs were in Dutch, so the language barrier proved to be rough on us. Typically the trains to Amsterdam Centraal leave from Platforms 1, 2 and 3. The train ride is about 15 minutes and they depart about 7-8 times an hour, so if you miss one, don’t worry too much. The train ride costs approximately €4.00 and can be purchased upstairs, outside of the airport terminals, at small kiosks. We embarked on our trip at the end of July, during peak travel season. Amsterdam was so humid, to an almost uncomfortable level, but I am from a desert-like town, so any humidity feels like a lot. I spent most of my days in shorts, dresses or jumpers and my boyfriend was mainly in shorts and tank tops. Warning though, the weather is fairly unpredictable, so we kept rain coats with us after we were caught in a torrential downpour and ended up taking refuge in Oude Kerk, which is the oldest church in Amsterdam, with free admission from our I Amsterdam City Card. Overall, Amsterdam was the friendliest of cities! 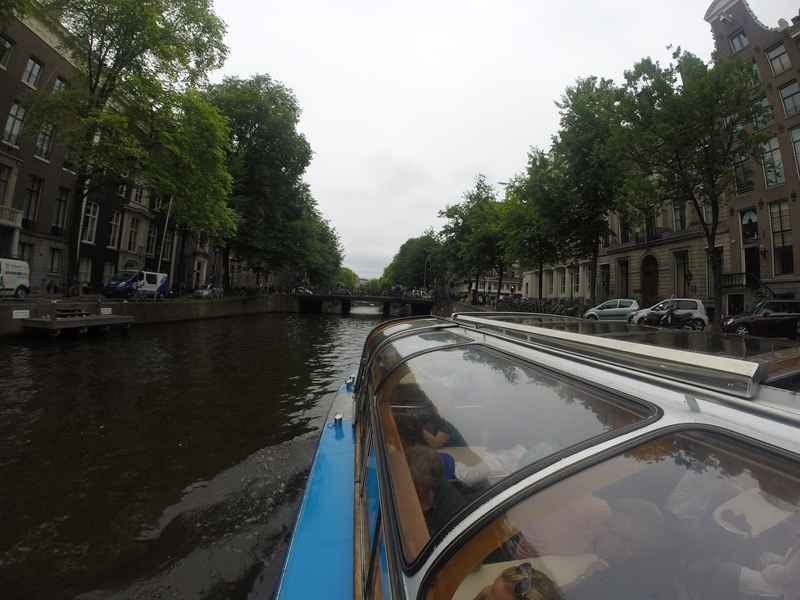 I loved the architecture and layout of the city and canals. It was so easy to navigate and every corner I turned showed a more beautiful site. The city was busy, crowded and constantly moving, but still had such a relaxed vibe. I would highly recommend visiting this beautiful city.